【Upgrade 400 Lumen Super Bright LED】 -- 8 LEDs with brightness of 400 lumens, provide bright lights at night for your garage driveway, garden pathway, patio, landscape, pool areas etc. 【Waterproof and Weather-resistant】-- Built with durable ABS plastic,easy to clean and no rust; with IP 44 waterproof lamp housing, you can mount this light outdoor and use it all year round. 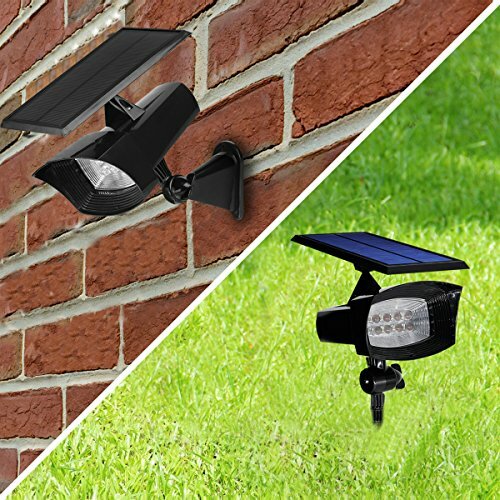 【Two Ways of Installation,Wide Range of Application】 -- Comes with a stake as well as a wall mount; you can use it as in-ground lights for your garden lawn, pathway,pond area,or garden landscape etc. 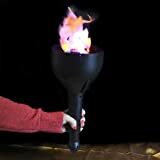 ; or as wall lights for your patio,backyard,front porch,garage driveway and so on. Please make sure that the switch is on "ON" position before you put it outside to charge. 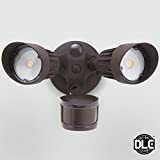 This wall-mount/ In-ground solar spot light is self-sufficient, weather-resistant, easy to install and completely wireless, a perfect lighting choice for your garden patio, lawns, pathway, garage driveway, decking, docks, pool areas and so on, where you don't have power outlets but in need of some lights for the long night. Working time:8-10 hours in hot summer with a full day's sun exposure;working time in Winter/Spring may vary from difference regions,weather conditions and sunlight durations per day.